Good morning! I can't believe it's January 3rd already! My boy is back in school today too. December fairly flew by I think! We're all ready to get back into our normal routines now. It's time for another challenge over at Critter Sketch Challenge blog! I'm super excited, because I designed the sketch for this week too! Please be sure to play along if you have time - the Stamping Boutique is our sponsor this month, and they have some fabulous images (like the one on my card) and you can be entered into the drawing for some freebies if you submit a card. Supplies are image by the Stamping Boutique colored in with Copics and crystal stickles. DP is DCWV and cardstock is SU Eggplant Envy and DCWV. Other supplies are nesties circle, punches, Stamping Bella dots, and misc ribbon from my stash. COLLEEN very beautiful defined color used. I like the map. LOVE this Colleen! The purple paper & ribbon go so beautifully with Tracey's amazing image! 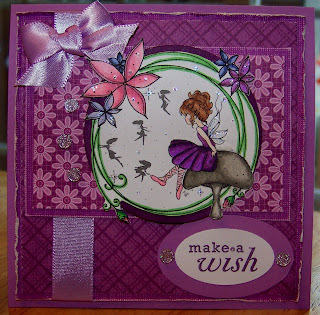 Gorgeous card, I love those purples and image is colored beautifully! TFS and Good Luck in TSB monthly contest! I know I have already told you how much I loved this one but REALLY....I LOVE THIS ONE! The colors are fabulous and so is your coloring! Her images are super fun to color huh!!! Love the ribbon and love all the layers!